This article is about the Minnie Riperton song. For other uses, see Loving You (disambiguation). "The Edge of a Dream"
"Lovin' You" is a song recorded by American singer Minnie Riperton from her second studio album Perfect Angel (1974). It was written by Riperton and Richard Rudolph, produced by Rudolph and Stevie Wonder, and released as the album's fourth single on January 14, 1975. Minnie Julia Riperton-Rudolph, known professionally as Minnie Riperton, was an American singer-songwriter best known for her 1975 single "Lovin' You" and her four-octave coloratura soprano. She is also widely known for her use of the whistle register and has been referred to by the media as the "Queen of the whistle register". Born in 1947, Riperton grew up in Chicago's Bronzeville neighborhood on the South Side. As a child, she studied music, drama and dance at Chicago's Lincoln Center. In her teen years, she sang lead vocals for the Chicago-based girl group the Gems. Her early affiliation with the legendary Chicago-based Chess Records afforded her the opportunity to sing backup for various established artists such as Etta James, Fontella Bass, Ramsey Lewis, Bo Diddley, Chuck Berry and Muddy Waters. While at Chess, Riperton also sang lead for the experimental rock/soul group Rotary Connection, from 1967 to 1971. Perfect Angel is the second studio album by American singer Minnie Riperton, released in 1974 by Epic Records. The album contains the biggest hit of Riperton's career, "Lovin' You", which topped the U.S. Pop Singles chart for one week in early April 1975. Richard James Rudolph is an American songwriter, musician, music publisher, and producer. The song peaked at number one on the US Billboard Hot 100 on April 5, 1975. Additionally, it reached number two on the UK Singles chart, and number three on the Billboard R&B chart. In the US, it ranked number 13 on the Billboard Year-End Hot 100 singles of 1975. 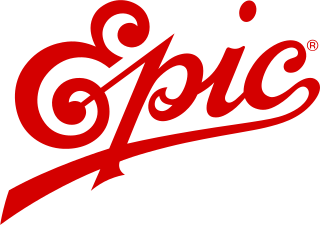 The Hot R&B/Hip-Hop Songs chart ranks the most popular R&B and hip hop songs in the United States and is published weekly by Billboard. Rankings are based on a measure of radio airplay, sales data, and streaming activity. The chart had 100 positions but was shortened to 50 positions in October 2012. The intro and first verse (couplet) from Lovin' You (1974) by Minnie Riperton. Maya Khabira Rudolph is an American actress, voice actress, comedian, and singer. Rudolph first gained prominence in the mid-1990s as a member of the alternative rock band The Rentals before joining The Groundlings improv troupe later in the decade. In 2000, Rudolph became a cast member on the NBC television series Saturday Night Live and subsequently appeared in supporting roles in films such as 50 First Dates (2004) and A Prairie Home Companion (2006). "Lovin' You" was among the first of several songs to top the US Billboard pop chart without the help of a percussion instrument. Prior examples of percussion-less Number Ones were Jim Croce – "Time in a Bottle" (1973), The Beatles – "Yesterday" (1965), and on the UK Singles Chart, The Beatles – "Eleanor Rigby" (1966). "A Huge Ever Growing Pulsating Brain That Rules From the Centre of the Ultraworld"
(1992) "Saving Forever for You"
"Lovin' You" has been covered by recording artists around the world working in a variety of genres including reggae, pop, rock, electronica, indie rock, R&B, soul, and hip hop. Ambient house is a subgenre of house music that first emerged in the late 1980s, combining elements of acid house and ambient music. Tracks in the ambient house genre typically feature four-on-the-floor beat patterns, synth pads, and vocal samples integrated in a style classed as "atmospheric". Shanice Lorraine Wilson-Knox, better known simply as Shanice, is an American singer–songwriter, actress and dancer. Wilson had the Billboard hit singles "I Love Your Smile" and "Silent Prayer" in 1991 and "Saving Forever for You" in 1993. In 1999, Wilson scored another hit song, "When I Close My Eyes", which peaked at #12 on Billboard's Hot 100 chart. Wilson is recognized for her coloratura soprano voice and her ability to sing in the whistle register. Leon Ware was an American music artist, songwriter and composer. Besides a solo career as a performer, Ware was best known for producing hits for other artists including Michael Jackson, Quincy Jones, Maxwell, Minnie Riperton and Marvin Gaye, co-producing the latter's album, I Want You. Inner Child is the second studio album by American R&B singer Shanice, released November 19, 1991 on Motown Records. The album peaked at number 13 on Billboard's Top R&B Albums chart. "A Huge Ever Growing Pulsating Brain That Rules from the Centre of the Ultraworld" is the debut single by the ambient house group The Orb. It was originally released in October 1989 and made the UK Singles Chart in 1990, peaking at #78. The 'Peel Session' version was also voted into #10 place in John Peel's 1990 Festive Fifty. In April 1991, it was released on the debut album The Orb's Adventures Beyond the Ultraworld. The title is taken from a sound effects track from Blake's 7 on BBC Sound Effects No. 26 - Sci-Fi Sound Effects titled "The Core, A Huge Evergrowing Pulsating Brain which Rules from the Centre of Ultraworld". The Orb are an English electronic music group founded in 1988 by Alex Paterson and The KLF member Jimmy Cauty. Beginning as ambient and dub DJs in London, their early performances were inspired by electronic artists of the 1970s and 1980s, most notably Brian Eno and Kraftwerk. Because of their psychedelic sound, the Orb developed a cult following among clubbers "coming down" from drug-induced highs. The Orb have maintained their drug-related science fiction themes despite personnel changes, including the departure of Cauty and members Kris Weston, Andy Falconer, Simon Phillips, Nick Burton, and Andy Hughes. Paterson has been the only permanent member, continuing to work as the Orb with Swiss-German producer Thomas Fehlmann and, later, with Martin "Youth" Glover, bassist of Killing Joke. Beyond recognition on their albums and concerts, his unauthorised use of other artists' works has led to disputes with musicians, most notably with Rickie Lee Jones. Love Lives Forever is the sixth studio album by American soul singer Minnie Riperton. Released posthumously in 1980, it was co-produced by her husband Richard Rudolph and released on her then-label Capitol Records. It consists of tracks Riperton recorded in 1978 during vocal sessions prior to her death, and music recorded after her early death, occurred on July 12, 1979. Come to My Garden is the debut studio album by American singer-songwriter Minnie Riperton which was produced, arranged and orchestrated by Charles Stepney and released in 1970 under GRT Records. It was re-released in 1974 on the Janus label, in the same time frame as Riperton's album "Perfect Angel" and her hit "Lovin' You." Adventures in Paradise is the third studio album by Minnie Riperton issued in May 1975 by Epic Records. The album rose to Nos. 5 & 18 on the Billboard Top Soul Albums and Billboard 200 charts respectively. Stay in Love is the fourth studio album by American singer Minnie Riperton, released under Epic Records. The album features the hits "Young Willing and Able" and the Stevie Wonder collaboration "Stick Together". Unlike her previous works, the soft soul elements here tend to fade, replaced by a more upbeat disco sound which was the musical trend at the time. "Stick Together" peaked at no. 23 on Billboard's Hot Dance Play, an alternate version known as "Stick Together " reached no. 57 on the U.S. Hot Black Singles chart. Minnie is the fifth and final studio album by American R&B/jazz singer Minnie Riperton. She died of cancer two months after its release, it was also her first album for Capitol Records. With a new record deal under her belt and a guarantee from the label of priority marketing and promotion, Minnie went right to work on what would be her final album. With husband Richard Rudolph, Keni St. Lewis, Gene Dozier, Randy Waldman, Marlo Henderson and Bill Thedford contributing songs, the album served as Minnie’s final statement to the music world and fans. The Best of Minnie Riperton is a posthumous greatest hits album by American singer Minnie Riperton, released in 1981 and issued by Capitol Records. The album consists of the hits like "Perfect Angel", "Lovin' You", "Inside My Love", and "Adventures in Paradise". Also included, her last two released singles "Here We Go" from the album Love Lives Forever and "You Take My Breath Away". "Inside My Love" is a 1975 single by Minnie Riperton from her album Adventures in Paradise. It was co-written by Riperton, Leon Ware and Richard Rudolph. Petals: The Minnie Riperton Collection is a posthumous 2-disc set compilation album by American R&B and soul singer Minnie Riperton, released in 2001, issued by Capitol Records. The compilation consists of songs from her albums released on Epic Records and Capitol Records. The collection includes her No. 1 pop hit "Lovin' You", the popular "Perfect Angel", "Inside My Love", "Adventures in Paradise" and "Memory Lane". Gold: The Best of Minnie Riperton is a 1993 greatest hits album by American singer Minnie Riperton, released by Capitol Records. The hits album features many of Riperton's popular hits, "Memory Lane", "Perfect Angel", "Inside My Love", and the No. 1 pop hit "Lovin' You". "Loving Arms" is a song written by Tom Jans and first recorded and released by Kris Kristofferson and Rita Coolidge as a duet in 1973. 1 2 3 4 5 6 7 Eskow, Gary (February 1, 2008). "Classic Tracks: Minnie Riperton's 'Lovin' You'". Mix . Retrieved March 25, 2019. 1 2 Chick, Stevie (June 29, 2016). "Minnie Riperton – 10 of the best". The Guardian . Retrieved March 27, 2019. ↑ Ankeny, Jason. "Minnie Riperton - Artist Biography". Allmusic . Retrieved March 26, 2019. 1 2 3 "Minnie Riperton – Lovin' You (Song)". Hung Medien. 1974. Retrieved March 24, 2019. 1 2 Wynn, Ron. "Minnie Riperton - Perfect Angel". Allmusic . Retrieved March 28, 2019. ↑ "Minnie Riperton - Lovin' You - RIAA Gold Certification". RIAA. April 8, 1975. Retrieved September 19, 2018. 1 2 "Minnie Riperton - Loving You". BPI. May 1, 1975. Retrieved March 25, 2019. 1 2 3 4 "The Late Minnie 'Lovin' You' Riperton's 70th birthday to be celebrated with special release". Pressparty. October 20, 2017. Retrieved March 15, 2019. 1 2 3 4 Hogan, Ed. "Minnie Riperton - Lovin' You - Song Review". Allmusic . Retrieved March 15, 2019. ↑ "Minnie Riperton - Lovin' You". musicnotes.com. Retrieved January 4, 2019. ↑ "Minnie Riperton - Lovin' You". songbpm.com. Retrieved January 4, 2019. ↑ Weaver, Caity (September 14, 2018). 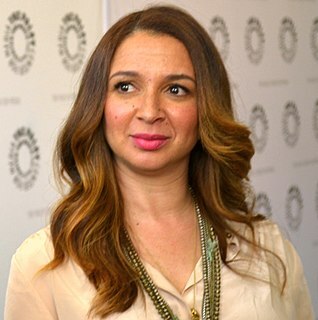 "How Maya Rudolph Became the Master of Impressions". The New York Times . Retrieved March 15, 2019. 1 2 Sexton, Paul (May 3, 2018). "Minnie Riperton's Atlantic Crossing With 'Lovin' You'". udiscovermusic.com. Universal Music Group . Retrieved March 15, 2019. 1 2 Wentz, Jimmy (July 19, 2013). "Shock On! 12 More Awesome Reggae Covers Of Classic Songs". VH1 . Retrieved March 23, 2019. ↑ "Hot 100 - Lovin' You - Minnie Riperton". Billboard . March 29, 1975. Retrieved April 7, 2019. ↑ "Adult Contemporary - Lovin' You - Minnie Riperton". Billboard . March 29, 1975. Retrieved April 7, 2019. ↑ "Hot R&B/Hip-Hop Songs - Lovin' You - Minnie Riperton". Billboard . March 29, 1975. Retrieved April 7, 2019. ↑ Easlea, Daryl (2009). "Minnie Riperton Perfect Angel Review". BBC . Retrieved March 26, 2019. ↑ "Minnie Riperton – Perfect Angel review". Classic Pop . March 2018. Retrieved April 4, 2019. ↑ Moore, Marcus J. (December 5, 2017). "Minnie Riperton - Perfect Angel". Pitchfork . Retrieved March 23, 2019. 1 2 "Top 100 End of Year AMR Charts - 1970s". Australian-charts.com. Kent Music Report. Archived from the original on January 24, 2017. Retrieved March 28, 2019. ↑ "Ultratop.be – Minnie Riperton – Lovin' You" (in Dutch). Ultratop 50. Retrieved April 5, 2019. ↑ "RPM Weekly Top Singles". Library and Archives Canada . RPM Weekly (archived). April 19, 1975. Retrieved February 25, 2018. ↑ "RPM Weekly Adult Contemporary". Library and Archives Canada . RPM (archived). April 5, 1975. Retrieved April 5, 2019. ↑ "Dutchcharts.nl – Minnie Riperton – Lovin' You" (in Dutch). Single Top 100. Retrieved April 5, 2019. ↑ "Charts.nz – Minnie Riperton – Lovin' You". Top 40 Singles. Retrieved April 5, 2019. ↑ "Minnie Riperton: Artist Chart History". Official Charts Company. Retrieved April 5, 2019. ↑ "Minnie Riperton Chart History (Hot 100)". Billboard. Retrieved April 5, 2019. ↑ "Minnie Riperton Chart History (Adult Contemporary)". Billboard. Retrieved April 5, 2019. ↑ "Minnie Riperton Chart History (Hot R&B/Hip-Hop Songs)". Billboard. Retrieved April 5, 2019. ↑ Brendan Lyttle (December 27, 1975). 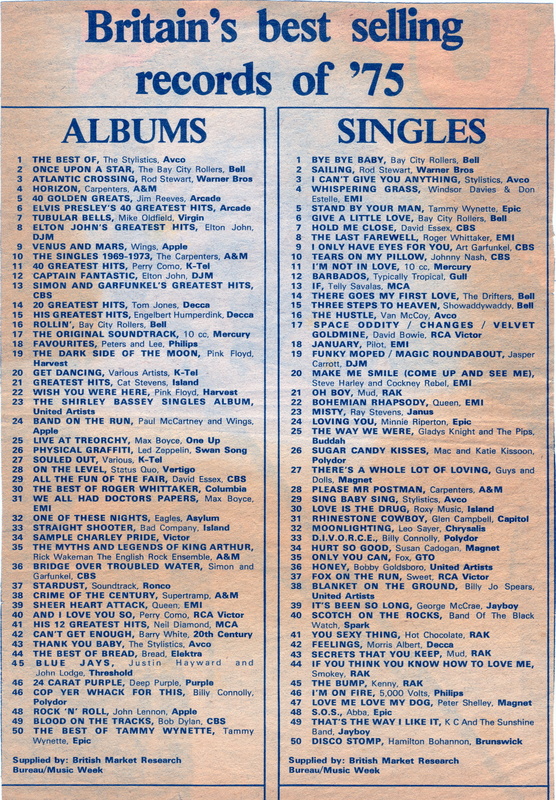 "RPM Top 200 Singles of 1975". RPM . Library and Archives Canada . Retrieved July 28, 2018. ↑ "Jaaroverzichten – Single 1975" (in Dutch). Hung Medien . Retrieved March 13, 2018. ↑ "Britain's best selling records of '75". Record Mirror . London: Billboard. January 10, 1976. p. 12. Retrieved August 29, 2016. ↑ "Top 100 Hits of 1975/Top 100 Songs of 1975". Musicoutfitters.com. Retrieved April 2, 2019. ↑ "British single certifications – Minnie Riperton – Loving You". British Phonographic Industry. Select singles in the Format field. Select Silver in the Certification field. Type Loving You in the "Search BPI Awards" field and then press Enter. 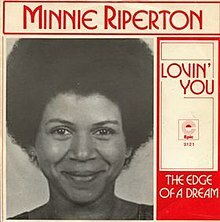 ↑ "American single certifications – Riperton, Minnie – Lovin' You". Recording Industry Association of America. If necessary, click Advanced, then click Format, then select Single, then click SEARCH. 1 2 3 Boyd, Brian (October 23, 1998). "Unidentified Flying Orb". The Irish Times . Retrieved March 27, 2019. 1 2 3 4 Wårstad, Jonas. "The Orb - Discography". discog.info. Retrieved April 2, 2019. ↑ "The Orb - The Orb's Adventures Beyond the Ultraworld". Allmusic . Retrieved April 6, 2019. 1 2 3 4 5 Anniss, Matt. "The History of Ambient House 1988-95 Part 1" (in Japanese). Red Bull Music Academy . Retrieved April 6, 2019. ↑ Bush, John. "The Orb - Artist Biography". Allmusic . Retrieved March 27, 2019. 1 2 Dave Thompson. "The Orb - Peel Sessions". Allmusic . Retrieved March 27, 2019. 1 2 Cinquemani, Sal (August 19, 2002). "Review: The Orb, Adventures Beyond the Ultraworld". Slant . Retrieved April 5, 2019. ↑ Bush, John. "The Orb - A Huge Ever Growing Pulsating Brain That Rules from the Centre of the Ultraworld". Allmusic . Retrieved April 5, 2019. ↑ "BBC - Radio 1 - Keeping It Peel - 03/12/1989 The Orb". BBC . Retrieved April 6, 2019. ↑ "BBC Radio 1 - Festive Fifty 1990". BBC. 1990. Archived from the original on December 20, 2013. Retrieved March 27, 2019. ↑ "The Orb: Artist Chart History". Official Charts Company. Retrieved March 25, 2019. ↑ "SoulBounce's Class Of 1991: Shanice 'Inner Child'". soulbounce.com. December 7, 2011. Retrieved April 7, 2019. 1 2 "Shanice - Lovin' You (Song)". Hung Medien . Retrieved April 1, 2019. ↑ "Shanice - Every Woman Dreams". Allmusic . Retrieved April 2, 2019. 1 2 John Alroy; Wilson, David Bertrand. "Shanice Album Reviews: Discovery - Inner Child - 21... Ways To Grow - Shanice - Every Woman Dreams". warr.org. Retrieved April 4, 2019. ↑ Norment, Lynn (November 1993). The Lives And Loves of New Pop Divas. Ebony . p. 42. Retrieved April 2, 2019. ↑ "Shanice". americanmusicchannel.com. Archived from the original on November 20, 2010. Retrieved April 2, 2019. ↑ Griggs, Tim. "Shanice - Inner Child". Allmusic . Retrieved April 2, 2019. ↑ "Picks and Pans Review: Inner Child". [[People (magazine)}People]]. February 10, 1992. Retrieved April 4, 2019. ↑ "Shanice Chart History (Hot R&B/Hip-Hop Songs)". Billboard. Retrieved April 2, 2019. ↑ "Shanice: Artist Chart History". Official Charts Company. Retrieved March 24, 2019. ↑ Atwal, Kay (June 12, 2013). "Janet Kay talks about Silly Games". Newham Recorder . Retrieved March 23, 2019. ↑ Cook, Stephen. "Various Artists - Burning Up". Allmusic . Retrieved March 23, 2019. ↑ "Electric Eel Shock – Transworld Ultra Rock". Discogs. Retrieved 5 October 2018. ↑ Amith, Dennis (October 22, 2007). "[WORLD GROOVE] Currently listening to ELECTRIC EEL SHOCK – TRANSWORLD ULTRA ROCK". j-entonline.com. Retrieved March 31, 2019. ↑ "Loving You (Minnie Riperton Cover) by Her's". Bandcamp. December 21, 2017. Retrieved April 1, 2019. ↑ Steward, Ciaran (August 23, 2018). "Her's: 'It's crazy; fans know the lyrics and everything'". Dork. Retrieved April 1, 2019. ↑ Hughes, Hilary (February 23, 2019). "Ariana Grande Effortlessly Covers Minnie Riperton's 'Lovin' You': Watch". Billboard . Retrieved April 2, 2019. ↑ Vargas, Chanel (February 22, 2019). "Ariana Grande Covered "Lovin' You" and Even Her Backup Dancers Were Mesmerized". PopSugar . Retrieved March 24, 2019. ↑ Grande, Ariana (February 22, 2019). "paused reh to do this lullaby i promised u ~ lovin u - minnie riperton". Instagram . Retrieved March 24, 2019. ↑ Thomas, Datwon (March 2, 2019). "T'Melle Shows How She's "Loving You" On Minnie Riperton's Classic Song". Vibe . Retrieved March 24, 2019. ↑ Peters, Lucia (November 28, 2018). "Burger King's Cini-Minis Are Available Through A Grubhub Offer, So You Can Relive Your '90s Dream". Bustle . Retrieved March 13, 2019. ↑ "1998 Burger King Cini-Minis commercial". YouTube . Retrieved March 13, 2019. ↑ "Disturbia [Original Soundtrack]". Allmusic . Retrieved March 13, 2019. ↑ Bates, James W.; Gimple, Scott M.; McCann, Jesse L.; Richmond, Ray; Seghers, Christine, eds. (2010). Simpsons World The Ultimate Episode Guide: Seasons 1–20 (1st ed.). Harper Collins Publishers. pp. 972–973. ISBN 978-0-00-738815-8. ↑ "Hans Zimmer / Lorne Balfe - Megamind". Allmusic . Retrieved March 12, 2019. ↑ "Domino's - The Official Food of Anniversaries". TV Ad Music. Retrieved December 3, 2017. "(Baby Tell Me) Can You Dance"
"I'll Bet She's Got a Boyfriend"
"When I Close My Eyes"